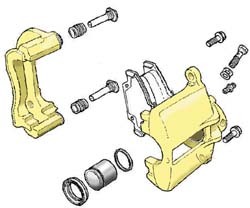 The standard brakes on the MGF and TF (excepting 160 VVC models) can best be described as 'adequate'. Without going into too much detail, these brakes are inherited from a number of sources within the MG Rover parts pin. The front discs for example are MG Maestro items. The rear callipers are Rover 800. The list goes on. Little wonder that there is some scope for improvement! The calliper design is a single pot, sliding calliper design. They work along similar principles to the rubber block brakes of your push-bike - the force of the piston pushing one pad onto the disc whilst at the same time pulling the other pad onto the opposing surface. Although cheap, this is not the most efficient design. Nor is the standard 240mm diameter disc necessarily the optimum size for a one tonne sports car. So if you want to make your car stop harder, bringing it safely to a halt in the shortest possible distance, what should you look at? A better calliper design. 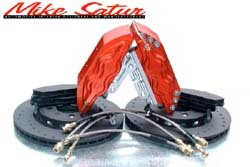 4 pot callipers are certainly preferable to single-pot sliding callipers, and now there is a huge choice to select from. EBC offer a range of different pad materials that are suitable for use with the MGF and TF ranges. These are colour coded black, green and red (there are also yellow stuff pads, but these are not suitable for road usage). 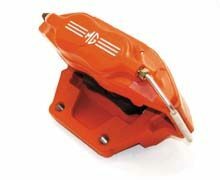 All the pads fit in the standard callipers, and work well with the drilled and grooved discs that EBC are also able to supply. These disc/pad combinations have won a number of plaudits from independent magazines, and green stuff pads have the admirable trait of limited brake dust production with better than standard braking performance. I personally found the black stuff compound pads to perform no better than standard pads, and to have a much shorter life span. I found the green stuff pads to be much better [than the black stuff pads] in both regards (although when removing the pads when I upgraded to Mintex 1177 pads, I found that the pad blocks had started to crack and flake - which may have something to do with some of the track work that my car is subjected to). I have not tried the red stuff pads. 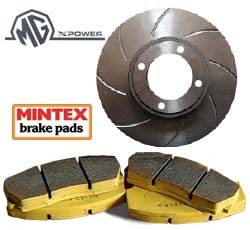 An alternative option to the EBC discs and pads are the Rover, now MG, Sport and Racing discs. These discs are the ones fitted to my car, and are grooved, but not drilled (although this design may have changed now that MGR have taken the manufacture of these parts in house). These discs are the ones preferred and specified by Tech-speed motor-sport, and are typically used in conjunction with Mintex pads. Mintex pads are available as a range of materials, from the fast road 1144s, through 1155s and racing 1166s to full-on 1177s that need to be ordered through Sport and Racing (for which you need to have a racing licence and be registered with one of the MG Club race/sprint series). The latter in particular offer outstanding braking performance from standard sized discs, with no cold-stopping penalty. Hugely recommended if you can get them - although you need to be aware that these  pads do have a tendency to 'eat' discs! The cost of high performance is high running costs. MG's own large disc option is probably very familiar - these red MG branded 4 pot AP racing callipers. Allied with huge 304mm discs, these brakes offer awesome braking performance, as well as fantastic good looks! Disadvantages? Unfortunately, those discs are so large, meaning that the callipers are pushed so far out, that they need special wheels to fit over them. These include the 11-spoke MGF Trophy and 11-spoke TF 160 designs, along with the Ultra-light weight wheels available as a special option as Sports Pack 3 with the TF. Click here for more on F/TF wheel options. If you are considering the MG large brakes, then you might as well consider going the full mile for 4 or even 6-pot AP racing callipers over discs of your choice (a range of rotor sizes are specified on their web site). Unfortunately, the rear brakes are for racing only: they possess no handbrake mechanism. Here's an option that you may not have heard of before: HiSpec. These chaps sell a range of discs and callipers that are suitable for the MGF and TF ranges - and uniquely, included options for the rear wheels as well as the fronts. Kits are available that fit under 15" wheels, as well as larger kits that are suitable for cars fitted with 16" wheel options. Paul has these brakes fitted to his MGF and is absolutely delighted with them. I was impressed with his ability to out-brake my F (Mintex 1177s on standard-sized rotors) at a recent track day. These are brakes that I'd certainly consider! A relative new comer to the big-brake scene, Mike Satur has certainly made a splash with this lavishly engineered titanium billet four-pot calliper and 280 mm discs. Andy has these discs and callipers fitted to his F, and seemed absolutely smitten with them! I've not seen anyone use them on a track yet, but have no doubt that these brakes should be as good as similarly specified systems from HiSpec etc. The discs, using standard callipers, do fit under 15" wheels. To fit the callipers as well however, would require the specification of 16" wheels to obtain the necessary clearance.